Day 3: Living in Thailand. What to bring with you, or should it be not to bring! 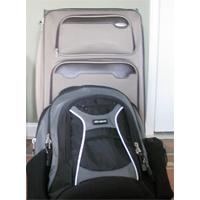 What to bring with you to Thailand, or not! 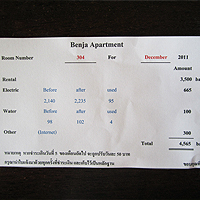 January 4th 2012 Staying in Thailand for the under 55's border runs and visas, along with a snapshot of the days expenses.. It is that time of the month, the rents due along with the utilities. I will be covering accommodation in greater detail later in the month, over a few day's as it is such a major point. No other expenses today. After 13 years in America I sold pretty much everything and left with a daypack and a mid sized roll on that you can see in the middle picture above. Before continuing on to Bangkok I stopped off in England for a few weeks to visit family, at this point I could have ditched the mid sized roll on, swapping it out for another very small daypack. You have probably heard it before "less is better" it really is true! You would be amazed at just how little you can live with. 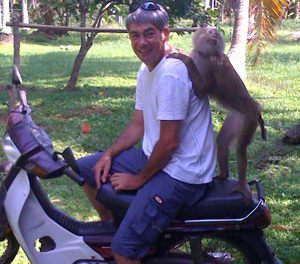 Here is my experience; on arriving in Thailand I settled on Phuket as a base, staying pretty much put for 6 months. 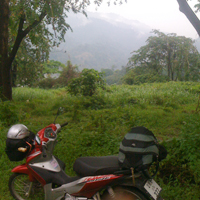 I then hit the road with the motorbike for 3 months, needing to get things down to the bare minimum I looked at all I had brought with me: 30% I was using daily, 40% occasionally, "every few weeks" the rest I had never used. I spent quite a few months traveling on the motorbike with the daypack you can see and another much smaller one I could cram in the front pannier. I never wanted for anything during that time, and had all I needed to run my business. I occasionally came across something I needed and just bought it for a few dollars. 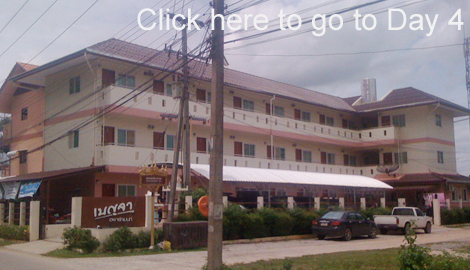 Continue Reading Day 4: Types of visa for Thailand and border runs.